In June 2019, UNH's site license to RefWorks will end and will not be renewed. We have carefully reviewed the pros and cons of the library’s site license and have concluded that the high cost of the annual subscription can no longer be justified when there are other free or low cost citation management programs available that are as good or better than RefWorks. Other factors that went into this decision included the combination of a shrinking RefWorks user group and RefWorks’ lack of cross-platform support. Current RefWorks users who would like to save their citations are advised to export them by July 1, 2019. We have created this guide to help users transition away from RefWorks. If you run into any difficulties, please do not hesitate to contact the Library for assistance. You may still need to access RefWorks. The RefWorks research guide contains login access points as well as this transition information. 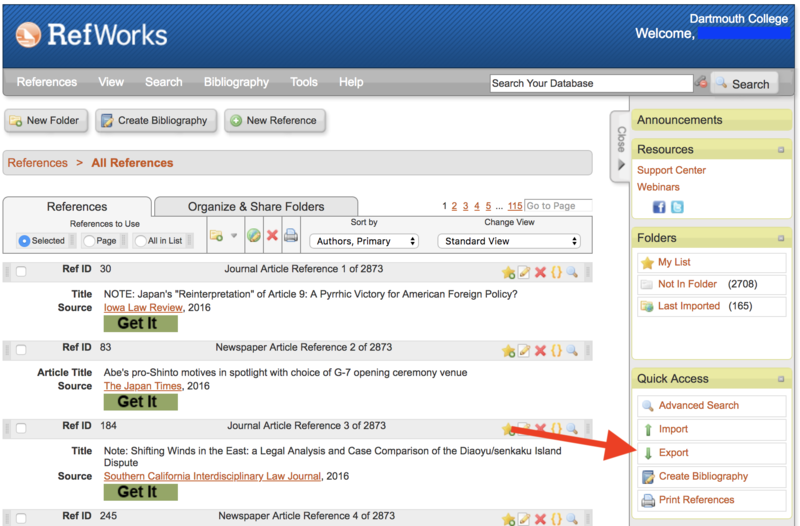 In order to export references from ProQuest RefWorks (Blue Logo), log in at refworks.proquest.com. 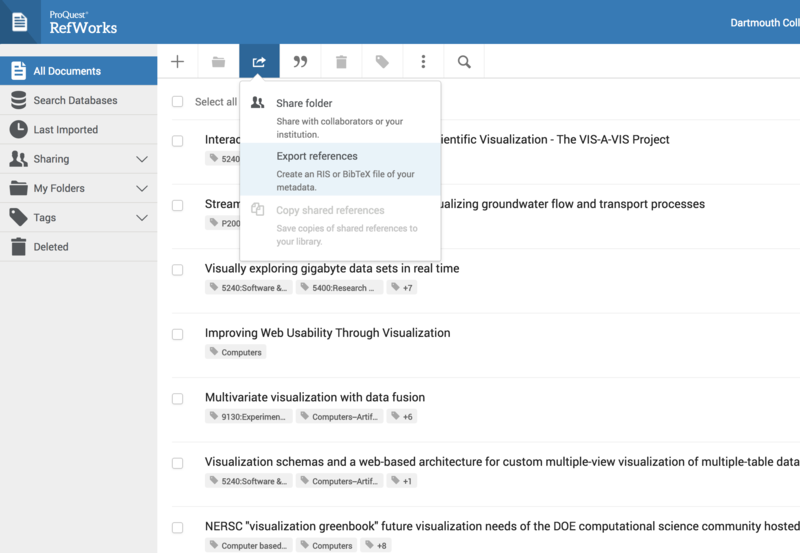 From there, use the "Share" button in the top navigation bar, and select "Export References" from the dropdown menu. From there, you can export all references by selecting "All References in 'All Documents.'" You can export your references as either a BibTeX or RIS file, both of which can be easily imported by other reference managers. In order to export your references from Legacy RefWorks (Orange Logo), log in at RefWorks.com. From there, use the "Export" button on the right-hand side to open the export menu. To export all of your references, use "All In List." You can export to a variety of formats, including an RIS file used by other citation managers. RefWorks will warn you if you try to export more than 500 references at a time, but it often still works. If you run into difficulties, please contact the Library for further assistance. Zotero is one of the reference managers that the Library recommends in lieu of RefWorks. This will create a new collection in Zotero with the citations you've just imported. NOTE: Your original directory structure (folders) from RefWorks will NOT be maintained, just the citations. You will have to recreate that structure in Zotero if you wish to do so. The Zotero research guide can further help you use Zotero.